Welcome to “7 Tech and IT Interview Questions.” If you work in information technology or are trying to find the right talent, you already know the tech landscape is vast and the skills needed by a Network Engineer are much different than those needed by a Help Desk Administrator. In this series we present seven interview questions specific to one position or functional area. In this post: Web Developer. Depending on the project needs of an organization, the role of web developer can encompass a wide range of responsibilities and requirements. At a very high level, the web developer’s primary responsibility is to ensure an organization’s website loads and functions properly across devices and browsers. The ability to implement data collection solutions such as Google Analytics and various other technology integrations is often required as well. Other key components include interpersonal communication, project management, and leadership skills. What development language are you most fluent in? What other development languages have you worked in and what is your proficiency? What operating systems are you familiar with? What is your experience with web servers? What databases have you worked with? Do you have any experience in scripting? If so, what languages? What is your strategy for Quality Assurance and cross-browser testing? 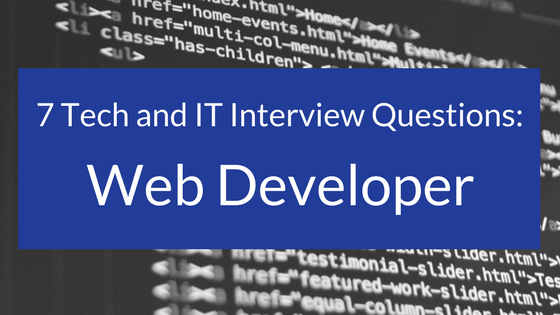 These questions are a starting point for assessing the skills and experience required of a web developer. Augment this list with questions specific to your company’s needs to find the right fit for your team. Are you a web developer ready to take on a new role? Do you need to add an experienced web developer to your team? Connect with Advanced Resources’ Technology Division. Learn more here.